When it comes to necklaces this season, more is more. This season pair up your sweaters, boots and handbag with double layered statement-making pieces of jewelry. While hoop earrings and dainty bracelets will be back in style, pair up your Fall apparel with multiple chains, retro pendants and dainty chokers. 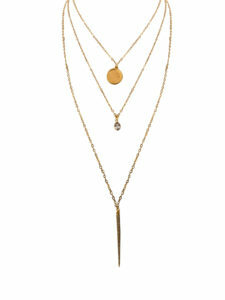 Get inspired by some stunning necklaces in our new collection and build your own layered look that speaks for itself! Don’t save that flashy necklace for a special occasion but pair it with your simpler go-to pieces to make a statement with your jackets and layered tops. 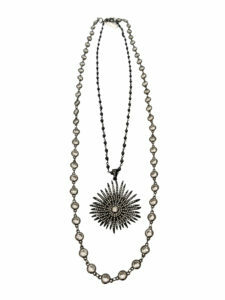 Our newest CLARISSA piece is a double chain necklace with a sunburst cz pendant for a statement look. When it comes to pairing your sweaters with a layered necklace, opt for different length chains to let each pendant necklace have its own moment and shine. Our AVA double chain necklace features a geometric shaped triangle with a moonstone and sapphire faceted beads plated in sterling silver. Another style to stay on trend with is using color blocking to pair with a solid-colored top. Go for multiple necklaces in the same metal such as the CHLOE, this three-layer necklace features gold coin pendants and crystal quartz gemstone that will pair with a brightly colored jacket to color block. Necklaces add instant pop to an outfit and adds some flair to a basic ensemble. 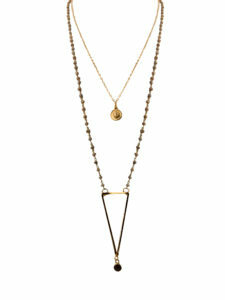 Get the look with our all-in-one necklaces that takes the work out of layering individual chains.